Technology opens new opportunities to boost businesses through mobile applications. According to Magrath and McCormick (2013) data shows that users are currently interacting with brands without having to go to the browser. Users keep an eye on their devices at all times and mobile applications have become an easy way to have a closer relationship with users and provide them a large number of solutions. Only on Google Play, there are more than 2.1 million apps available, and it is estimated that users have installed between 30 and 40 on their devices. (Statista 2019). As stated by (Eastman et al. 2014) 9 out of 10 millennials use and own a mobile device where they shop from. Which means companies, both physical and digital, can obtain great benefits with an application since it is a powerful tool for businesses of all sizes, especially for fashion retail brands as millennials are a major part of their actual target market. The company will stand out from the competitors by having a mobile application through which users can interact with the brand in a unique way that it cannot get through other channels due to the rapidity in which messages reach consumers. Also, it can boost into the recognition of the brand if it is well managed to make it more functional and useful so that it stays on the user’s device. By developing an app, not only the brand will strengthen but is a new sales channel can be open. Where users can make purchases of the products as they would normally do from a physical branch or an online store. All the product information, news feeds, promotions, and prices are right at the user’s fingertips and with the use of push notifications, brands can benefit from having a closer interaction with their audience. Stimulating their engagement by sending real-time promotions, updates or any reminders that get the audience to engage with the brand even when they are not aware of it. A great opportunity brands have with push notifications is that by asking users location permission they could personalize the customer experience sending push messages applicable for each specific zone or region (Warren et. al 2014). 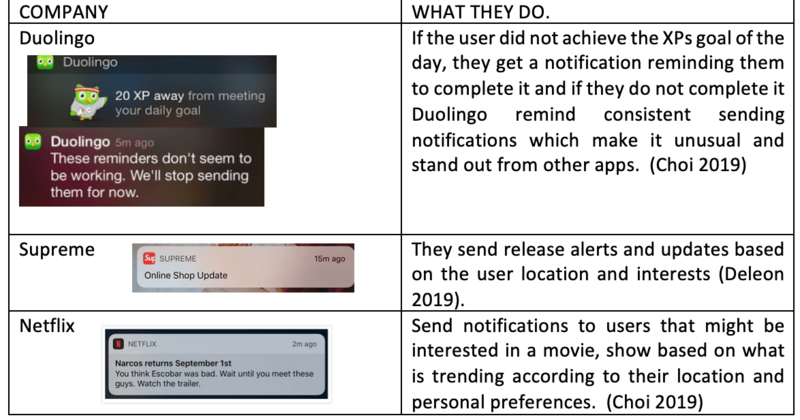 Push notifications can help business track user behaviour and collect user data trough click rates and interaction timings in order to identify which notifications are more likely to be opened to improve the connection with users. As stayed by Leanplum, the open rate of personalized content has four times the generic open rate, which means the more personal and relevant to user interests the message is, the better the results earned. Applications are a great opportunity to solve the different needs of the target audience, depending on the approach the brand wants to give and the objectives they want to achieve. For instance, creating a loyalty program, rewarding them via the mobile app drawing customers’ attention with last minute offers, coupons, in order to increase downloads and reinforce loyal customers. This can be beneficial for the brand as it enhances brand consistency and value. The application is a way to get customers involved with the business and it can make a difference in the way it communicates with the users. Having support messaging feature is a way for users to reach the brand for returns or any other question since nowadays people tend to communicate more via text than over the phone (Howe 2019). 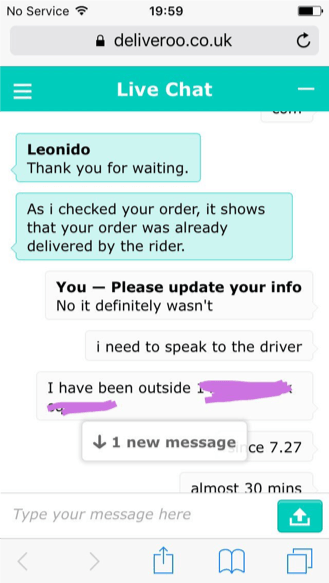 As an example, Deliveroo has a live chat where customers can have immediate responses. In order to develop a mobile app, it is important to consider on defining the goal and the purpose the brand wants to achieve, also, to analyse and gather enough useful information about the sector and target. According to Ziembiński (2019) analysing similar apps characteristics, reading comments from users is essential in order to analyse a possible number of mobile visits, rebound percentages, what to improve and how the brand could be innovative. With all the ideas and research, the brand can hire an agency specialised on app development that can help with the coding and technicalities to build the app. (Haselmayr 2019). As there is a strong competition in each sector, it is key to create and give a whole new valuable experience to the client in order to call their attention and help the brand reach its goals while competing with other brands. A good example of this is Gucci, they use their mobile app to transform customer shopping by implementing new features of recognition from different magazines, where customers can take a picture of the item they want, and the app will load the specific item for them to get it. Also, combining the in-store experience with the online one by the use of QR codes that help customers interact through different products that are shown in-store screens, making the shopping experience easier, faster and more innovative. Similarly, using Bluetooth the customer can know all the information from each in-store item and can call assistance through the app (Milnes 2019). To conclude is very beneficial for a business to invest in a mobile app as it gives the brand a closer customer knowledge that can help to reach out users by following different alternatives which can make sales and customer loyalty rise. However, the trick is knowing how to use the data the brand gets from customers behaviour in order to create a successful digital strategy and make new audience download the app and the ones who already have it actually use it and interact with it. Choi, J. 2019. 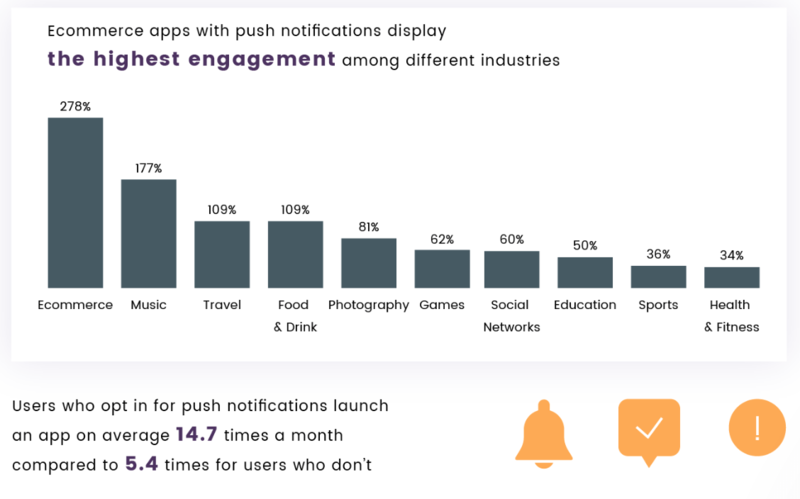 The Keys to Smart Behavioral Push Notifications. Available from: https://customer.io/blog/behavioral-push-notification-strategy/ [28 February 2019]. Deleon, J. 2019. Never Miss Another Drop With the Supreme iPhone App. Available from: https://www.complex.com/style/2013/08/supreme-iphone-app [28 February 2019]. Eastman, J., R. Iyer, S. Liao-Troth, D. Williams and M. Griffin. 2014. The Role of Involvement on Millennials’ Mobile Technology Behaviors: The Moderating Impact of Status Consumption, Innovation, and Opinion Leadership. Journal of Marketing Theory and Practice 22(4): 455-470 [Online]. Haselmayr, M. 2019. Here’s Why Your Business Needs Its Own Mobile App. Available from: https://www.forbes.com/sites/allbusiness/2014/11/17/heres-why-your-business-needs-its-own-mobile-app/#6350adf7327f [22 February 2019]. Howe, N. 2019. Why Millennials Are Texting More And Talking Less. Available from: https://www.forbes.com/sites/neilhowe/2015/07/15/why-millennials-are-texting-more-and-talking-less/#2d73aa4c5975 [28 February 2019]. I. Warren, A. Meads, S. Srirama, T. Weerasinghe and C. Paniagua. 2014 “Push Notification Mechanisms for Pervasive Smartphone Applications,” in IEEE Pervasive Computing, vol. 13, no. 2, pp. 61-71 [Online]. Magrath, V. and H. McCormick. 2013. 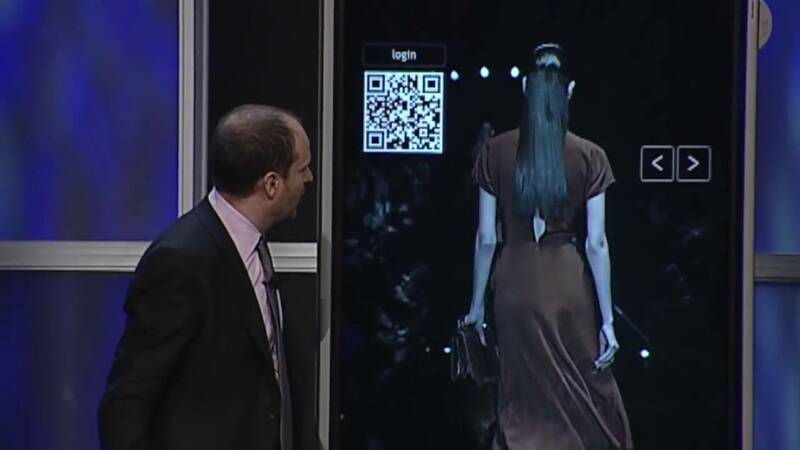 Marketing design elements of mobile fashion retail apps. Journal of Fashion Marketing and Management: An International Journal 17(1): 115-134 [Online]. Milnes, H. 2019. Why Gucci is still investing in its mobile app – Digiday. Available from: https://digiday.com/marketing/gucci-still-investing-mobile-app/ [22 February 2019]. Statista. 2019. App stores: number of apps in leading app stores 2018 | Statista. Available from: https://www.statista.com/statistics/276623/number-of-apps-available-in-leading-app-stores/ [22 February 2019]. Ziembiński, J. 2019. Get your fashion brand an app. Seriously. – inFullMobile Blog. Available from: https://blog.infullmobile.com/get-your-fashion-brand-an-app-seriously-9ebf4de1af90 [22 February 2019].